We are super lucky to have so many options for flying on most days. Today we had many happy pilots flying at least three sites, and we could easily have spread out to a few more! Four of us met to fly at Kaena for our second day in a row out there, this time in easy ridge lift under very high clouds, cruising all around from the point to the drop zone, until the window closed. 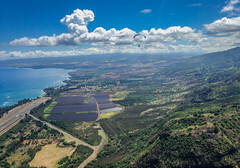 Four flew Kahana in super east low cloud conditions, all landing at Punaluu. And at least a handful flew Makapuu in strong east low cloud conditions. If there are more details or pictures to share, post them in a comment! Okay I'll go first! So I was expecting a similar day to yesterday, light thermic sea breezy conditions. And I think that's what we had when Drew launched, and scratched his way up, as I was hiking up with Jim. But by the time I launched, texture had filled in on the water, with whitecaps, and I had an easy time climbing up to join Drew, as did Jim. It was Jim's first knob launch! It was more ridge lift than thermals, although it was a healthy mix of both. Drew blazed out past the drop zone towards Kaaala, and I followed but not quite as deep, before we turned back. I flew down toward the point but not all the way because the flow was too east to guarantee a trip back from there. By the time Thom arrived we were landing after a couple hours up, and the air was already getting weird. Soon after that it turned super leeside, with gusts and dust devils and westerly flow. Seems like that place often works in small windows like that. Often in the morning. We felt pretty lucky to get that timing right! Then we heard that KNA was working. So without a shot of Skyalis I left the Dill to seek the next Dealer. KNA was a feathered soup as we arrived, Duck and Fowl-er had just landed calling their window good for a local low in the bowl out front flight. Steve and Stalker were still up giving us a show from the LZ where it was drizzling. Not worth the cover charge for me to hike. Jeff headed to PUN beach and arrived with 3 retrieves, Alex, Duck and I. I left as Alex and Duck went to get Steve. Woody had at least 3 students at SKU. Soar Kahana University, another batch of monkeys on the way. On route back home, Reaper sent word that MPU was working but low and out front. So, I skipped strike three got home to find he had already landed. He and Sharky had beat me to the retirement community. It was Margarita time in Annettes pool. Highlight of my day and that was as good as it got for me. Congrats Jim for launching the Knob. He had hiked up it and down it the day before. He said he had to get that monkey off my back and was glad he did. Drew has been flying out there every day these past weeks and was glad to have some company. We gotta get that kid to post conditions out there sooner. Today I joined the list of flightless birds, emu, ostrich, kakapo and now Sidehill. But at least for me there will be tomorrow, I HOPE! Thanks for the brief Alex. A fun little flight at KNA yesterday! It was enough to salvage what was almost a flightless weekend (yikes!). Props to Kevin for going first and making it look good. It was pretty darn east - more so when Kevin launched, but even when I hiked up I briefly considered hiking back down. But, seeing there were no issues climing out and knowing I'd be landing around the corner anyways, I followed. Cloud base was too low to go anywhere but it was just nice to be in the cool air and away from the mugginess below. I especially liked landing at that new little replenished sand beach LZ in Punaluu, and then being retrieved by so many HPA dignitaries at once. What a fun reception, thanks guys! I arrived at MPU to find Jorge and Maui had just landed tandems. It was a bit light and a bit east, but totally flyable. I watched Shawn bomb out on his 1st attempt from Juice. He was thinking normal trades; it was not. I launched and scratched my way up all the while trying to fix my inverted pod. Easy flight to a moderately low cloud base of 1700'. Lift was everywhere except back in Waimanalo as the clouds were even lower at Pua Kona. At one point as I glided out from the hang launch my vario had my L/D ratio at 42.3:1 Super boaty convergance. I also had 38 mph downwind speed. Probably could have glided to Lanikai down the beach. Shawn hiked back up and was able to scratch his way up to from Juice when he figured out the wind direction. Garrett followed as we soaked up some frosty beverages with Ginny and Sharkey at the LZ.